Unai Emery has praised Emile Smith Rowe after the youngster grabbed yet another Arsenal goal on Thursday evening (via Arsenal.com). It was far from the ideal playing conditions for a football match but Arsenal’s young team didn’t appear to be affected too badly. The Gunners secured a 3-0 victory over Voskla Poltava in snowy conditions in Kiev to top Group F and secure passage into the next round of the Europa League. Joe Willock and Aaron Ramsey grabbed a goal each but head coach Unai Emery reserved special praise for Emile Smith Rowe who opened the scoring on the night. “He is taking confidence, he is taking responsibility and also I think today his performance in 90 minutes is very good,” Emery said after the match. “He is a good example for the other young players. We think they can help us but they need the confidence of playing matches, not only working with us in the training sessions. Arsenal have a promising group of young players right now and they certainly showed that on Thursday night. 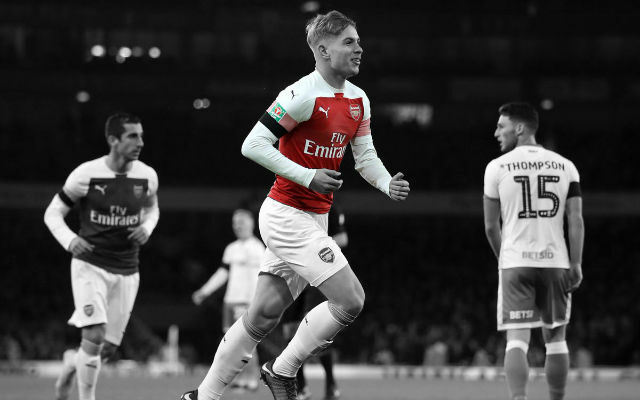 Emile Smith Rowe was the pick of the bunch in the 3-0 victory and deserves all the credit.